“Take a picture. It will last longer.” This is believed by every individual who wants to cherish their moments with family and friends during special events and occasions. Pictures hold a significant meaning through their visual storytelling with the emotions and subjects and a zeitgeist for the history books. Photographic subjects could be landscapes, events, concepts, and people, in this case, father and child bonding time. Be moved with our collection of father and child’s Images that will be perfect for Father’s Day, design projects and future references. We promise they are of high-quality for an easier utilization. You may also go through our list of Mother’s Day images. It is in a son’s instincts to act the same way as their fathers, for positive doings, that is. Example, for this lovable father and son duo, shaving their faces beside each other counts as a special bonding time. 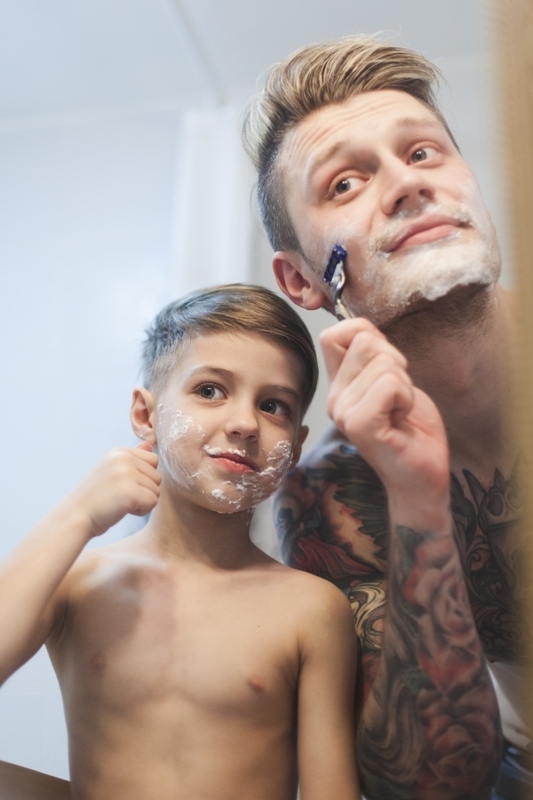 You can notice that the son isn’t holding a razor probably due to safety reasons but that doesn’t disrupt the adorable fun time they are having. On the technical side, the lighting in this picture gives the subjects a smoother complexion and gives shine to their hair, overall giving a soft effect on a priceless father and son bonding time. Our dads are the best! Most of the time we regard them as our superhero with unconditional love as their super powers. 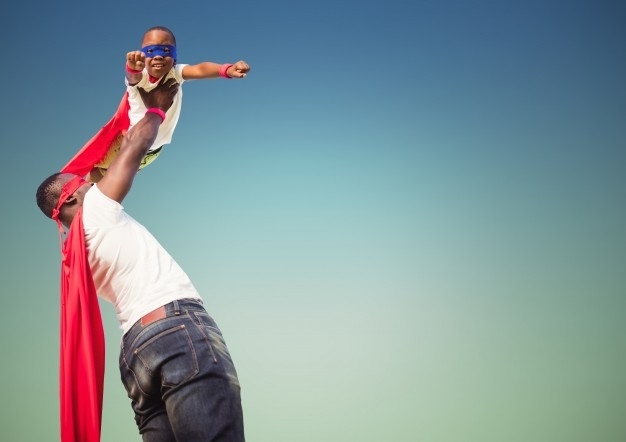 This father and son image best represents the bond and connection hardwired in both individuals. Moving to the flipside, this image boasts a good lighting and exposure to give emphasis on the subjects as well as it is backed up with a gradient blue sky. You can also see the use of primary colors of red, blue and yellow; standard color schemes for superheroes. The use of natural lighting in this father and daughter image highlights the daughter as an emphasized subject. That is due to the composition of this image that gives the audience a flow to direct your attention to the photographic elements—this starts from the daughter up towards the Father. Despite the receding background color, the whole image possesses soft and direct elements. Above is another clean image on this list due to the dominant use of the color white. Despite the commanding color scheme, your point-of-view is directed to both of the subjects’ smiles. It might not be as pearly white but the enjoyment and happiness translate well in this image. What are these images for? While these images create an emotional and moving response to the audience, you could use that reaction for your design projects and as a Father’s Day gift idea. Art references. You could use these images as references for your drawings, illustrations or paintings. Refer to these father and child images for their gestures, perspective, movements, expressions and for color theory. Design references. You may apply these father and child images if you want to use your designs in a digital form. These images could be used as references for your vector designs, line art, graphic design, illustration, character design and so on. Since the possibilities are endless when it comes to design, you may freely apply these graphics to create any interactive or animated designs. Inspirational posts. Use these father and child images to create inspirational posts for your website, as social media content and so on. You could turn these images into videos and tributes for your fathers. Advertising inspiration. Every designer or advertiser hits that creative block. If you are stuck in one, use this list to get your creative juices flowing. Be inspired with this casual perspective of father and child bonding and be moved by the affection shown to you. Advertising collateral. These images could be used for posters, banners, web banners, copy writing, publishing and so on. Greeting cards. These images are perfect for greeting cards for their moving and heartwarming scenarios. You could edit and add text or add in some elements depending on your design preference. Use these images to your heart’s content and make it big. Don’t forget to enclose them in envelopes. Parents take their kids out on trips and adventures to expose them to the fantastic beauty and harsh realities that we live in despite not being able to fully comprehend the situations around us. That is what parents wants us to see and we probably might remember those tiny details of the trip but we’re sure that they were there to accompany us through the journey and destination. In this father and son image, you can experience tons of textures from the waves down to the bark of the trees. It adds more drama and personality to the image. The beauty of this father and daughter image is the candidness that translates in this image. The technical beauty of this image as well is the lighting and exposure, avoiding the despised against the light error. There is vibrancy in the greenery and skin complexion and it is finished off with a mighty fine contrast. This is an adorable take on creative direction and storytelling. This father dog with his pup will surely put your audience in awe and probably give them an intense urge to squeeze this subjects. Even the simplest forms of bonding time could turn into one of the special times you’ll remember. There isn’t much to say subjectively about this animated image of a father and son since it is well translated in a few seconds of frames. But what makes this image more moving and emotional, besides the story line, is its moving textures and elements. The cast of shadows changes by frames adding more movement and perspective despite it being rendered in a two-dimensional form. 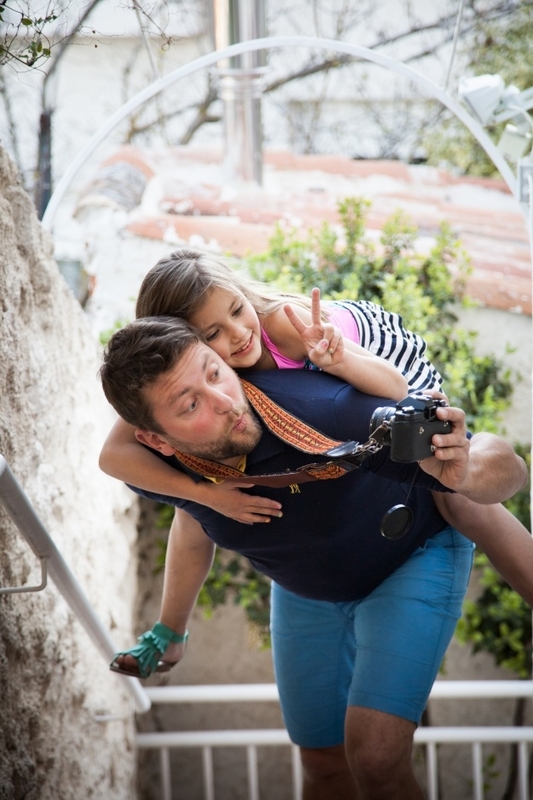 Take a picture and it will last forever especially this father and child images with its moving and emotional yet candid and casual translation of the paternal roles in a child’s life. We hope that this collection will be of great help in crafting your father’s day gift or design project; however, you’ll use these image. You may also browse through our extensive selection of free Father’s Day cards so you can wish your beloved patriarch a happy Father’s Day.